So, it's not just me. Jon C has also received one of those unsolicited emails; this one from GreenStones, an accountancy practice. The aim of this newsletter, it says, is to inspire you and your business to become the best that you can be. 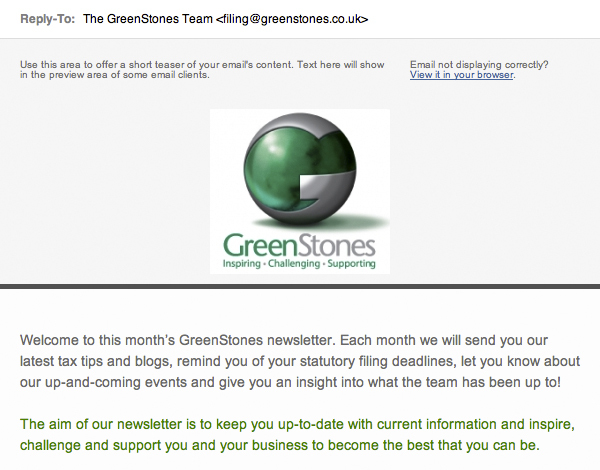 By leaving entirely unedited the text at the top left which is taken directly from whichever email template was used. If that's the best you can be, GreenStones, it's actually not much better than my worst. Oh joy. I've just checked the website and the business is based in Peterborough.